About an Hours Work (not inlcuding breaks) and About $7. 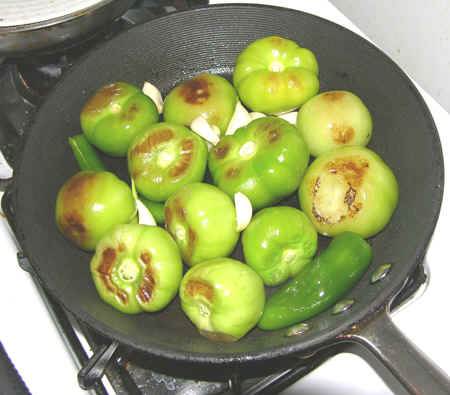 Prepare the Green Sauce: Roast garlic, peeled tomatillos and peppers in a skillet under very low heat. I slit the peppers and remove the seeds to make sure the sauce will not be too hot for children. Turn the items every few minutes until they are softened and browned all around. 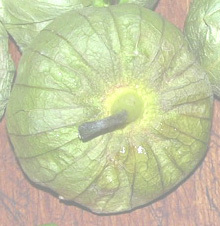 After garlic, tomatillos and peppers are roasted, place them in a blender to grind them into a green sauce. Also grind in some black pepper, cumin and salt. If you grind in the cilantro leaves at this point you have a very good green sauce for tortilla chips, etc. However, here I save the cilantro to add at the end of the cooking step. 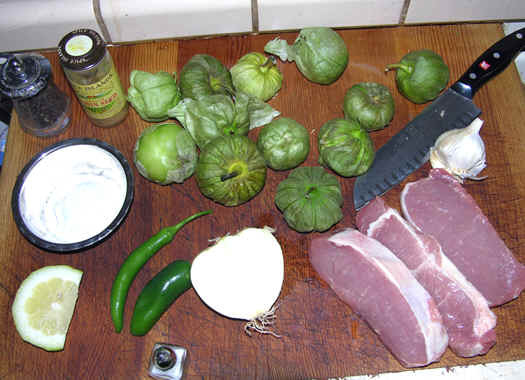 Sauté the meat: Cut the pork into large (about 1.5 inch) chunks. I like to toss the pork into a plastic bag with some flour and spices to coat the meat before browning. 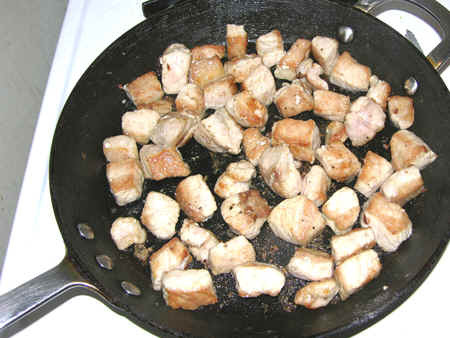 Sauté the flour-coated pork in a hot fry pan with a couple tablespoons of corn oil until browned. Pour the ground green ingredients from the blender into a large sauce pan. Drop in the browned meat. I like to spill a little white wine or beer into the meat fry pan while it is still hot to harvest the cooked juices from the bottom (deglaze) of the pan. 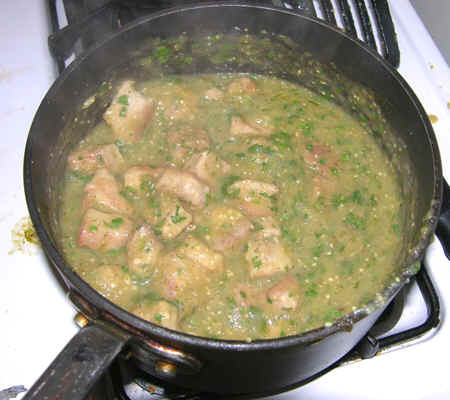 Then, pour the deglazed juices into the sauce pan with the green sauce and meat. Simmer the meat and sauce on very low heat for at least a half hour (1 hour better to tenderize the pork) with intermittent stirring. Before serving, add the lemon juice and chopped cilantro leaves and simmer for another 5 minutes. Sauté the 1 cup of uncooked rice in 2 tablespoons of corn oil along with the the diced onion and spices. Continue under medium heat with frequent stirring until the rice is browned. 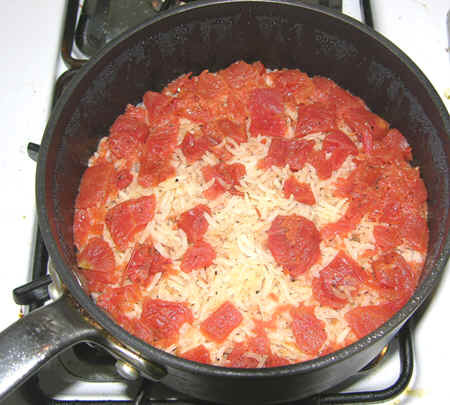 Chop the tomato into the hot rice grains and wilt them a little. Throw in the water and broth. Continue heating until you have a rolling boil. Cover the pot and leave on very low heat for 10 minutes. Stir one last time and cover. Turn off the heat. Do NOT remove the lid for another 20 minutes! At the end of the 20 minutes, the rice will be ready to eat. 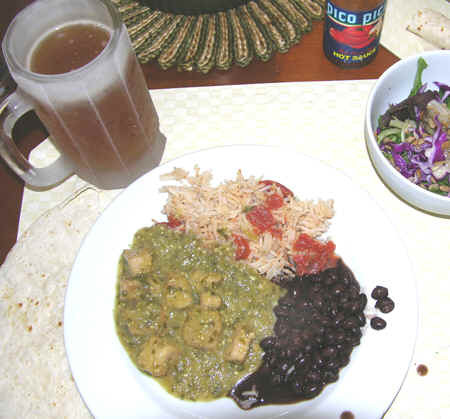 Serve chili verde and rice on an open plate with beans, or make green burritos by stuffing the items into a soft tortilla.